What if you could bring the good old days of online marketing and skyrocket your results once again? What if you could increase conversions, and lower your cost per acquisition? We are constantly looking for ways to improve our returns on marketing and ad spend. But it’s easier said than done. In one of our latest Facebook Messenger Campaigns, we were able to decrease our cost per lead by 27%. What’s more shocking is that in one of our campaigns, just in the first 4 – 5 hours, we were able to achieve 98% delivery rate, 81% open rate and a 22% click-through-rate. If you could consistently get results like that, your ROI would go through the roof. Your effort and expenses would drastically go down, while your results and conversions would improve dramatically. That’s exactly what Neil Patel has seen with Facebook Messenger Marketing. He has experienced open rates as high as 88% and clickthrough rates as high as 56%! Molly Pittman, VP of Marketing at DigitalMarketer has achieved similar results. Clearly, this is an effective digital marketing strategy, but how are these astounding numbers possible? A lot of it has to do with timing, and if you don’t want to miss out on results like these, now is the time to focus on and master Facebook Messenger Marketing. Early adopters of this approach will be lightyears ahead of the competition in a few years when others are trying to play catch up. Make no mistake about it – Facebook Messenger Marketing will explode in the coming years. We are standing at the beginning and there will never be a better time to get on board. Five years from now, when this strategy is overdone, it will, of course, be less effective and therefore too late. Why is this marketing method going to be so big? People are on their phones, they’re on Facebook, they’re on iMessage, WhatsApp, and Facebook Messenger. Phone calls and emails are becoming more tedious while texting and messaging is quick and easy. Messenger is quick, easy, and convenient, and that’s why more and more people are using Facebook Messenger as one of their main communication tools. In fact, the most recent stat puts Facebook Messenger users at 1.3 billion, and that number is expected to double by 2021. At the same time, only 31% of businesses are using Facebook Messenger, so we’ll say it again: now is the time to master Facebook Messenger Marketing. One of the newest and greatest technologies of today for marketers is the ability to have automated conversations using artificial intelligence (AI). Facebook bots are highly interactive, engaging visitors right away by answering their immediate questions. You can use these Messenger bots to build trust. Most people surveyed say they feel more confident about a brand when they are able to message them. Whether they realize they are talking to a chatbot or not, it starts the process, and live chat with a representative can kick in once the conversation moves to a point beyond the chatbot’s capabilities. It doesn’t take a chatbot developer to set one up. You can easily create one in two minutes on your own using MobileMonkey.com, Chatfuel, or ManyChat. By setting one up to answer questions that you get asked over and over again, you can cut down on man hours, build trust, and close sales with more efficiency and ease. Capturing leads using Facebook Messenger is similar to capturing leads through an opt-in form that links to your email marketing system. Marketers can still use popups, slide-ins, boxes, and buttons to attract and capture leads, but the leads are housed in Facebook Messenger. Leads can even be gained through Facebook Messenger when someone leaves a comment on your Facebook page. Capturing leads in this way makes retargeting your leads a snap since the contacts are already on Facebook. Plus, you’ll know more right off the bat about your leads than you could ever know through email marketing (gender, age, where they work, where they went to school, where they live, what they look like, what they like, etc.). You use one of the opt-in methods such as a ‘Chat With Us’ button, Messenger Ad, Exit Intent popup, etc. to get the conversation started over messenger with your target audience. You then engage and deliver value by giving your visitors something that will help them with their problem or simply answer their questions (hint: Your FAQs will be crucial here). As you are conversing with your messenger audience, you can start bit by bit to ask them questions including personal information like email & phone. All of this is stored in the bot and can be pushed to your CRM when you decide to. 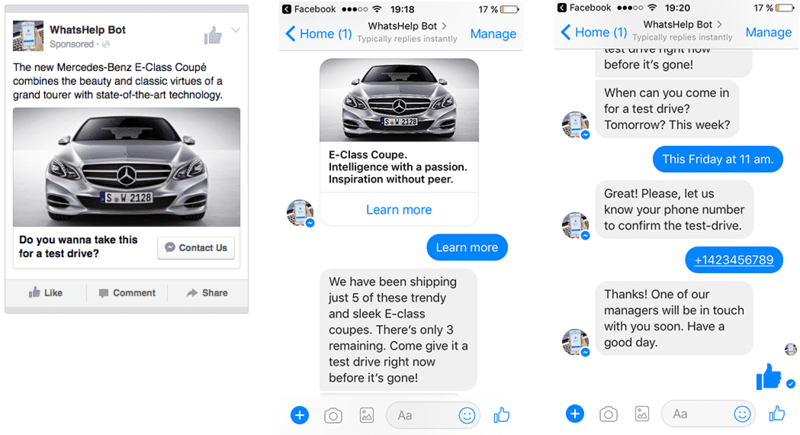 Through Facebook Messenger, businesses can send out message sequences just like they would do with email marketing. What is unique is that these sequences can happen much faster than with email marketing. For example, instead of waiting a couple days before sending the next message, you can send several messages over right away within a number of minutes or however you want to work it. 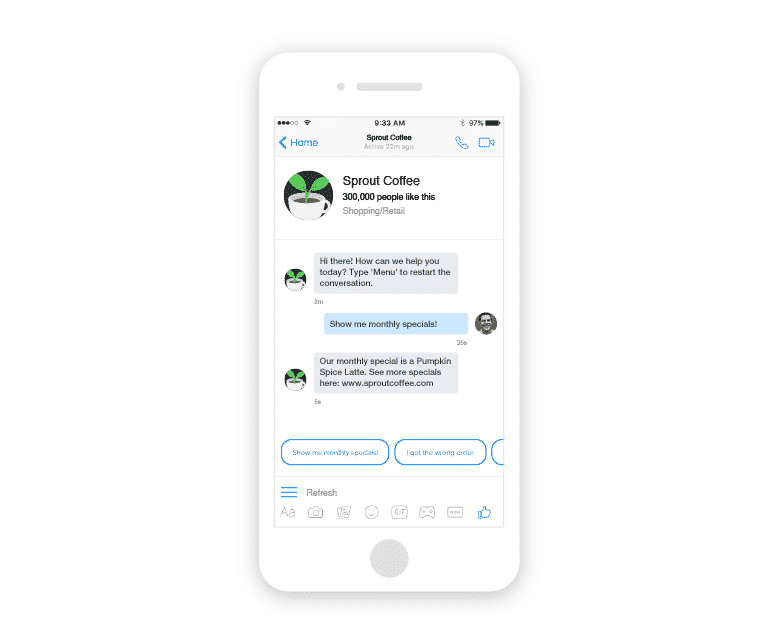 What’s especially beneficial about this feature is that you get instant responses to your messages since the whole idea of Facebook Messages inspires people to act right away. On the other hand, with email marketing, your emails can be ignored and lost in a cluttered inbox or spam filter. Through Facebook Messenger, you can create an automated sales funnel, send downloads and content upgrades, and then segment people into different targeted lists. Segmenting can be done by triggering a certain chat sequence if a person mentions a keyword during an interaction with the Facebook Messenger bot. Facebook Messenger marketing helps marketers achieve higher open rates and clickthrough rates, which allows for more leads, sales, and conversions. At the same time, it helps enhance awareness about your products, services, and brand. Facebook Messenger conversations lead to meaningful connections because they involve natural and friendly conversations instead of pushy sales tactics. It simplifies the sales process by providing an easy, convenient, and conversational way for people to make a purchase. The ad appears in the newsfeed, and when the ad is clicked, Facebook Messenger opens, and a conversation begins. You can further target the ad using interests, demographics, etc. From there, you can use ManyChat to send out Sponsored Messages to the people who have connected with you through Messenger. You get the conversation started with the chatbot by asking a few questions that will lead to a sales conversation. Sponsored Messages are similar to email marketing, but they use Facebook Messenger. These ads show up in the Messenger inbox. Sponsored messages can only be sent to people who have already messaged your page in the past. This option works great for flash sales, updates, and reminders. Facebook Messenger marketing is simpler than email marketing for both the marketer and the user. It uses a one-click subscription process instead of having to double opt in to an email list. Results are almost instantaneous since people are used to responding to messages of this nature quickly. Companies can reach targeted audiences quickly and then continue a relationship in a friendly, conversational way. With all of that going for it, it’s clear why Facebook Messenger Marketing is one of the most important marketing strategies right now. We’ll say it again: don’t wait to get started with Facebook Messenger marketing! If you get started now, you can enjoy the benefits for many years to come. You don’t have to try all of the strategies mentioned above. Just get started with one of them this month and don’t look back!